Sit down, sugar. Get comfortable. How about a piece of pie? Are you all set, now? All right then, here’s my story. I never once set out of a purpose to figure out who did murder. But to my way of thinking I never once had a choice about it either. The first time I tried to find a killer was back in nineteen and twelve, when my girl Phoebe fell for the neighbor boy. Which would have been fine but for the fact that the sheriff suspected him of the murder of his own daddy. I had to do something, didn’t I? After that, I figured my crime-solving days were behind me. Until Alice got mixed up with a man whose late wife had met a suspicious end. After that, some low-down bushwhacker shot Shaw’s brother Bill right out of a tree and killed him dead. How could I let that stand? Then the next year I went to Enid to be with my sister, whose husband was about to cross over Jordan. When I got there I found that her son-in-law was missing, and it looked mighty suspicious when we discovered that he owed a bunch of money to the most dangerous man in the Cherokee Strip. But the most hair-raising time of all was in the fall of 1915. Shaw and the boys went do a little bird hunting on that piece of property out by Oktaha that Grandpapa has let run to ruin. Except that instead of a quail, one of Shaw’s dogs brought him a prize he could have done without - an old boot that had the bones of the late owner’s foot still in it. Seems the dog found the washed-out grave in the woods and a skeleton whose skull was sporting a bullet hole right between the eyes. That put an end to the hunting trip, let me tell you. It bothered Shaw a lot, disturbing the dead like that. I could tell he was fretted when the fellows got home the next day. Me and him talked about it a spell, and he was feeling better until strange things started happening around the farm. I reckon he was right to be worried. Someone - or something - had followed him home. We were both mighty relieved when he captured a young Creek Indian who called himself Crying Blood skulking around the farm. He told Shaw that he had followed him home hoping to find a white haired man who had killed his brother. Shaw was pretty riled up at the boy for scaring us like he done, so he tied him up in the barn with the idea of hauling him in to the sheriff the next morning. Only thing was that Crying Blood didn’t make it to the morning. Some evildoer crept into the barn and killed the young fellow with a spear through his heart. I hate to see a life cut short, especially such a young one. Why, that child wasn’t even sixteen years old, not much older than my boy Charlie. Shaw like to died himself. And I’ll tell you, I know him well enough to figure out that he had no intention of waiting for the law or anybody else to deliver justice, not when the safety of his family was at stake. The sheriff figured out that the boy might have gone to the Creek boarding school in Eufaula and decided to go down there and find out his real name and maybe his folks. I should have got my suspicions up when Shaw encouraged me to go along. I had set my mind to do anything I could to help so I said I would, but it turns out Shaw was just trying to get me out of the way. The minute we drove out of sight, he saddled up and set out to confront the killer back at Grandpapa’s abandoned farm. You wonder how far a man will go to protect his family? Well I’ll tell you, if the man is Shaw Tucker, however far it takes. My reason for being on this earth is to raise up these ten children to be honest, upstanding folks, and I figure that means I have to do everything I can to protect them while they’re young and don’t have a lick of sense. Well, yes, I reckon I’ve done some things for my youngsters that might not be entirely legal, but I’ve never in my life done anything that I didn’t think was just. And truth be told, sometimes I’ve chosen kindness over justice. Being a mama or a daddy isn’t always sweetness and sunshine, honey. Sometimes you’ve got to bare your claws and be meaner than all the meanness in the world. I don’t intend to ever stick my nose in the law’s business again. Not unless one of them pesky youngsters gets himself in trouble again. Now, that’s about it, pun’kin. You want to stay for dinner? 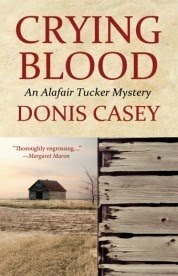 Donis Casey is the author of five Alafair Tucker Mysteries,The Old Buzzard Had It Coming, Hornswoggled, The Drop Edge of Yonder, The Sky Took Him, and the just released Crying Blood. Her award-winning series, featuring the sleuthing mother of ten children, is set in Oklahoma during the booming 1910s. 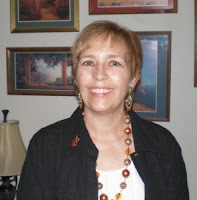 Donis lives in Tempe, AZ, with her husband, poet Donald Koozer. Good Heavens! I feel like I just sat through a family reunion..lol. The voice of a couple of my aunts played in my head as I read this. Now I've got to start reading them. Sounds wonderful!! "Sometimes you’ve got to bare your claws and be meaner than all the meanness in the world." *smile* My aunts would have said..Meaner than a mama grizzly bear! I think I'll be stayin' longer than for just dinner . . . I'd love to stay for dinner, as long as you keep telling stories! Now, about that pie???? Thanks for dropping by, and come back, now, y'all. And many thanks to Gayle for having me today. I just discovered your books this year, and I am gobbling them up. The characters are wonderful, the descriptions of daily life are gripping, and the food is all on my forbidden list. Of course, I'm almost 70 and have to watch everything. I just love the historical quality of your books and look forward to the next. Another winner, with or without dinner and pie! I love Alafair!! Great post! Anybody want to take odds on which of them pesky younguns gets in trouble next? Regardless, I'll be around to see. Thanks, Donis -- and Alafair -- for a lovely visit. I love every one of you right back.